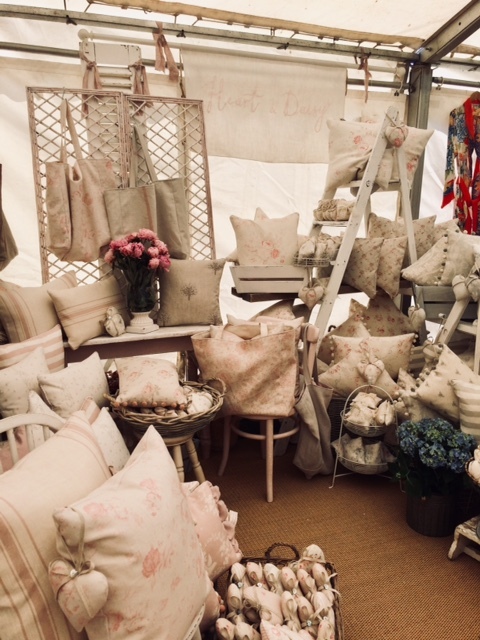 Heart and Daisy makes cushions, bags and hearts. 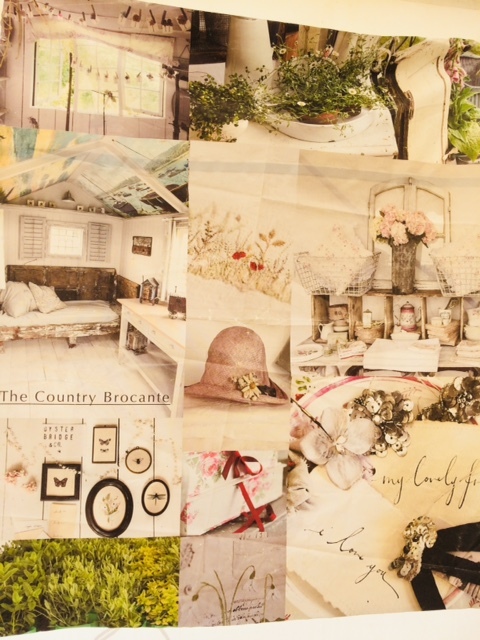 The Summer Country Brocante Fair is on today, Saturday 30th June, in the grounds of Cowdray Park, Midhurst. 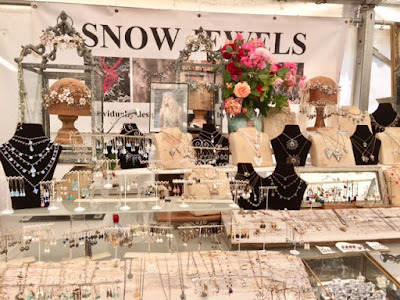 I went yesterday morning and thoroughly enjoyed looking at dozens of stalls. Rachel Ashwell, of Shabby Chic fame was there, signing her latest book, and Cabbages and Roses were there selling their pretty clothes and fabrics. I went looking for handmade and I am hoping that some of the makers I found will soon have work in Handmade Happiness. Meanwhile I will show you what I was tempted to buy in tomorrow's post! Today I went round the Buriton Art Trail. Just a few miles from Petersfield, Buriton is a little village built around a church and a duck pond and it's full of the sort of cottages you would love to live in! One of the nicest things to do is to sit down with a pile of white paper and layer paint onto it and see what results. I thought it would be fun to use some of these painted papers together with the odd torn paper from a magazine, like the background to the yellow-green button above, as background to the buttons. These buttons are the largest I covered. See more colours and sizes by scrolling down to a recent post where I pictured lots of them. I made these yesterday afternoon when the shop was quiet. Today I'm planning to make some textile necklaces and if they get finished I'll sew some smaller buttons onto collaged painted papers. Now the question is: Will anybody buy them? More old buttons bought yesterday. The blue ones are made of glass. 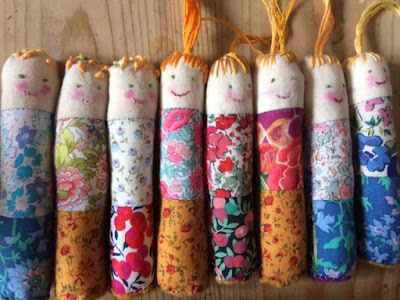 Regular readers will know that finding an old 'finger doll' from a few years back made me want to make some more. These ones are a bit fatter than the original. I just drew round my longest finger for the pattern. Also these are new, improved because there are four different Liberty fabrics on each and because I like the back as much as the front I decided to embroider faces on both sides! I love to use old buttons in my makes. Whether it's to do up a necklace or bracelet or to decorate a doll or a collage, old buttons have far more visual impact than new buttons. Agree? A message in push pins at Anthropologie - always so innovative! I bought this plate in the Anthropology sale. Love their paper bags as much as the plate! London on a Sunday...I haven't done that for a while. I met one of my lovely daughters in Fenwicks and we had a good look round Liberty. If I could make clothes I would love to make her a dress from one of the 'art' fabrics pictured above. And I could have happily taken home that velvet covered chair. Talking to my daughter always re-inspires me. So does going to nice London shops to 'get my eye in' as my mother would have called it! I rarely buy anything but just seeing good displays of desirable merchandise encourages me to try harder with my own shop! Bunny slippers for a grandaughter from a pattern by Fiona Goble. The jumper is knitted by Patricia and in the shop. Since having the shop I've made lots of small things to sell at a reasonable price. This week I've been sitting at my worktable making. It was a nice surprise to come across the finger doll pictured above. Years ago I made lots of these and they must have sold well because she's the only one I have left. I drew round my longest finger for the pattern. Last night I soaked a piece of calico in tea to achieve a more flesh like colour and ironed Liberty scraps for the bodies. Hopefully I'll have the sewing machine out and get some made in the shop today. I love velvet, especially soft silk velvet and even better, silk velvet that has been hand dyed in colours that blend into one another. 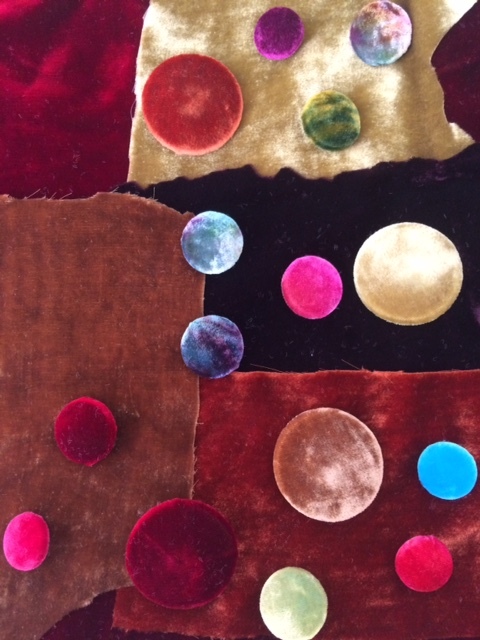 Years ago I was lucky enough to get my hands on a quantity of velvet expertly dyed by my friend Alison Crosthwaite. 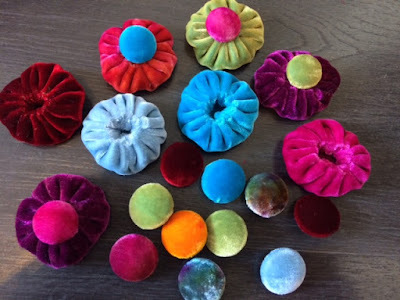 We swapped because she liked my handmade buttons - not velvet ones, the ones I used to do with patterns on them. I've tried dyeing velvet myself but wasn't happy with the results. Woman - know your limits! Some makers always say their sales are 'fine'. I can only be honest. Life is hard at the moment. People aren't spending. If proof were needed that retail is in the doldrums, House of Fraser has just announced it is closing down half of its department stores. And you already know that Marks and Spencer is closing 100 of its stores. One idea to bust the Brexit slump is to have something so cheap in the window it is irresistible. That was my idea this week. So I have painted dozens of 'friendship beads' and put them on a dyed silk tie. They can be worn as a bracelet or anklet where the silk is longer. Just £1 each. I wonder how many will sell today, Saturday? I'll let you know. Meanwhile I have another 30 beads on the table in front of me to paint before work! I want to have more of my own jewellery in Handmade Happiness but, as usual, I want it to be as original as possible so I am at the trying out ideas stage. Yesterday a lovely lady was telling me about a fascinating one year course on Oriental Art at the Victoria and Albert Museum in London. She glanced at what I was doing and said,'Ah, I see you are making buttons'and in my imagination I could see a long plain velvet coat with the puffs with button on top ranged down the centre as 'buttons'. The buttons don't have to do up, they could each have a large popper under them. I'd like to wear a coat like that in the winter. It's peony time in the garden. Love them! 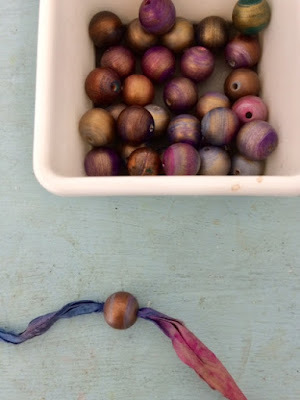 This week I have been making necklaces and painting beads for them and making buttons and velvet beads to be made into necklaces. Hearing recently that Marks and Spencer were closing 100 stores was a comfort to me... the down turn in spending is wide spread. With the uncertainty of what lies ahead for Britain and the lack of confidence in our politicians to negotiate a good deal for us, people are holding back from spending money unnecessarily. Who knows what the future holds? The question is, will there be any more money around in two years time and can retailers like me, who still need to pay the same rent and bills regardless of what money is spent in the store, be able to hold out until the time we are officially 'out' of the EU? I'm seeing many shops going under at this time. But I am determined to ride this out. Handmade Happiness has been around for nearly 7 years and I'm not caving in yet!! Interestingly I spoke to someone who had a shop for 14 years and recently retired. The first 7 were Heaven she said and the other 7 were much more difficult. It seems to me that we have been in a 'recession' for a long, long time.